'The Table' might sound a very boring title to this post but its translation in Bulgarian 'Масата' (Masata), has a whole load of cultural siginificance and I would go so far as to say that it represents the centerpiece of both Bulgarian family and social life. 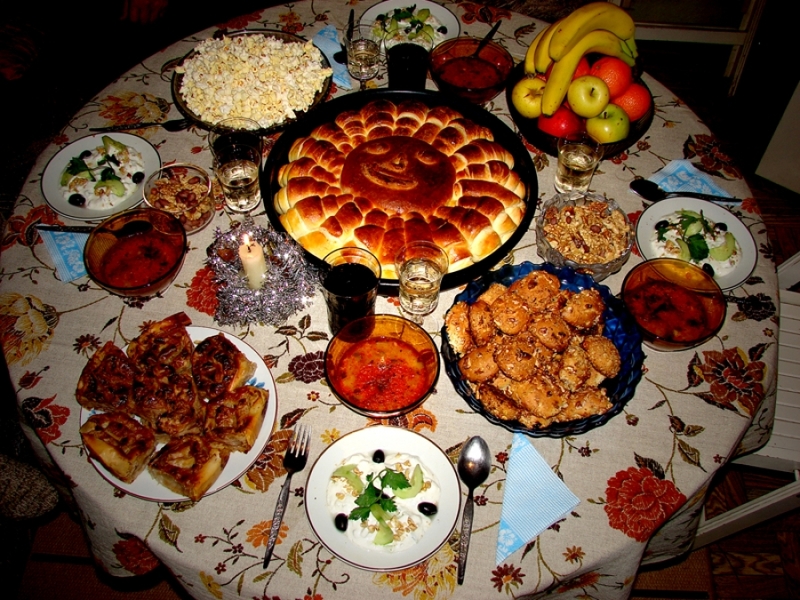 Not many Bulgarian family, social or cultural events pass without 'the table' being heavily involved. In fact even when there is no official event going on (which isn't very often) 'the table' is still inevitably the centre piece. My first meeting with 'The Table' came at my first visit to a Bulgarian friend's home for dinner. A Bulgarian friend from Tenerife, Margarita, was back from Tenerife and in Sofia for a couple of weeks visiting family so I was duly invited over to her father's apartment for a family dinner. 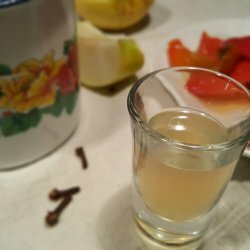 I had only been in Bulgaria now for just over a month and I was really looking forward to going to a Bulgarian's home for the first time and getting more immersed in their culture. Plus, I was growing a bit sick of the pasta in tomato sauce that I was cooking up for myself every night. I had read in my Bulgarian textbook that you never go over for dinner, or 'na gosti' as Bulgarians call it, empty-handed. I asked my teacher for suggestions about what I should take and flowers seemed to be the sensible option. Now if there's two things in Sofia that there is never a shortage of, that is Pharmacies and flower shops. They are everywhere. So I bought a bouquet of flowers from a kiosk at the side of the road and made my way to Margarita's father's apartment. He also lived in one of the white tower blocks, not too far away from mine, on the 13th floor. Margarita was also to be there so hopefully it wasn't going to be too taxing on my Bulgarian even though I could now hold a basic conversation and understand bits and pieces. There seemed to be about 15 people there as soon as the apartment door opened, all squeezed into the corridor to greet me. Quite a welcome. They all seemed really friendly and genuinely glad to see me. After the introductions and hellos they all seemed particuarly keen that I put some slippers on. I glanced at their feet and noted that yes indeed they were all wearing slippers too. They could have opened up a slipper shop such was the choice of slippers they had. I hadn't worn slippers since I was eight years old and told Margarita there was no need, I was ok just in socks. This apparently was a no-no and so on the slippers went. There was a large round table in the middle of the living room set-up as if ready for a royal feast. There was also a huge round loaf of bread that they told me to rip a piece off and dip it into some coloured salt. It was pointed out to me that one of the women had made it herself. The apartment looked really homely and cosy, not what you imagined when looking at the imposing tower block from outside. I got sat down on the round table and Margarita started to give me the low down on all the different snacks that were on the table. There were 'сърмички' (sarmichki) which were cabbage leaves wrapped around rice and mince meat, home-made 'баница' (banitsa) which was basically a pastry dish with white cheese and a whole load of other delicacies displayed beautifully in traditional ceramic brown plates adorned with Bulgarian patterns. The plate right in front of me was a mountain of tomatoes, cucumbers, peppers and white cheese. Margarita's father filled up my glass with a drink that apparently was also home-made and called 'Rakia'. I took a little sip straight away and thankfully just managed to hold back the coughing. I was told this was to go with my salad. After tasting it I wasn't too sure whether I had to pour it over my salad or drink it. Having said that as I was half way through my second glass of rakia I noticed that I was beginning to like it after all. We were sat on that table for hours, food coming and going, drinks being refilled. In fact I'm sure my glass had a censor at the bottom because the moment I finished one glass of Rakia, Margarita's father would immediately fill it up again with a big smile on his face. I think he was really pleased I liked his Rakia. I was holding my own with the table chit-chat in Bulgarian for the first half hour but after that I think my brain just had Bulgarian overload and I couldn't assimilate anymore. I found it really tiring trying to concentrate for so long. Just as I thought the meal had come to an end I was invited to try some sausage or 'суджук' (sydjyk). This, I was informed, was ideal with a glass of red wine (also home-made it turned out) so having drunk 2 rakias with my salad, 2 beers with my main meal I was now washing it down with home-made red wine. This was becoming a bit of a marathon. But at least I was now magically talking fluent Bulgarian. There was a lot of laughter, a lot of story-telling, a lot of jokes that I didn't understand but hopefully laughed in the right places, even some dancing. They were all really enjoying themselves, there were no awkward silences, no drunkeness. My first experience of a Bulgarian family seemed very outgoing and seemed to love sitting round the table and chatting and laughing, loved having a good time. I was really made to feel welcome and by half one in the morning we were finally finished and I got a taxi home. 6 hours at the table! And that was only the beginning.